Finally a Place Where You Never Have to Say I'm Sorry! DAPHNE, Ala. (WKRG) — In tonight’s What’s Working, we take you a place where children with special needs can let loose and have fun. It’s a new kid’s gym in Daphne that opens a week from Sunday. It’s called “We Rock the Spectrum Daphne.” It’s a place where typical children and those with special needs can play together. “We Rock the Spectrum” is a national franchise and the first location in Alabama. Owners, Kevin and Maura Coley, wanted to open a place where special needs children could feel safe while enjoying themselves. Maura has worked with special needs children as a speech pathologist. 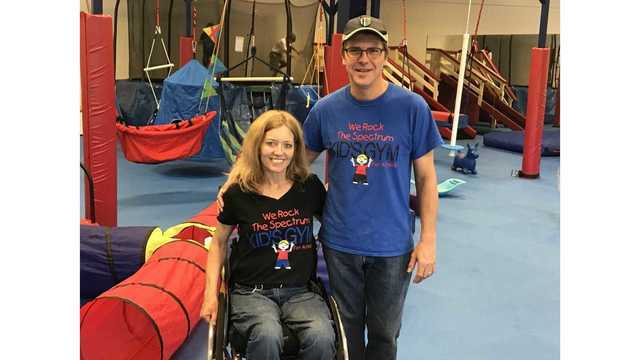 The “We Rock” gym provides sensory-safe play for children with autism, special needs, and neurotypical development. The zip line and many swings are the highlight. Maura and Kevin Coley are opening “We Rock the Spectrum” gym in Daphne. “We really encourage total inclusion. It’s good for our kids with special needs, and it’s great for our kids who are typically developing. The more opportunities we give to our kids to play together, the more opportunities they have to learn and grow together,” Maura said. The gym also has a calm room where children who might be over-stimulated can go to relax. It’s around the corner from the main play area. Mom, Mollie Robinson, loves having a place where her young son, Simon, can enjoy himself. Simon is four years old and has Down Syndrome. She got a special sneak peek at the gym this week. This entry was posted on November 13, 2018 by David TEST! Ephraim.